Add comfort to your lifestyle with this luxury quilt set. It is a nice inclusion for any home. 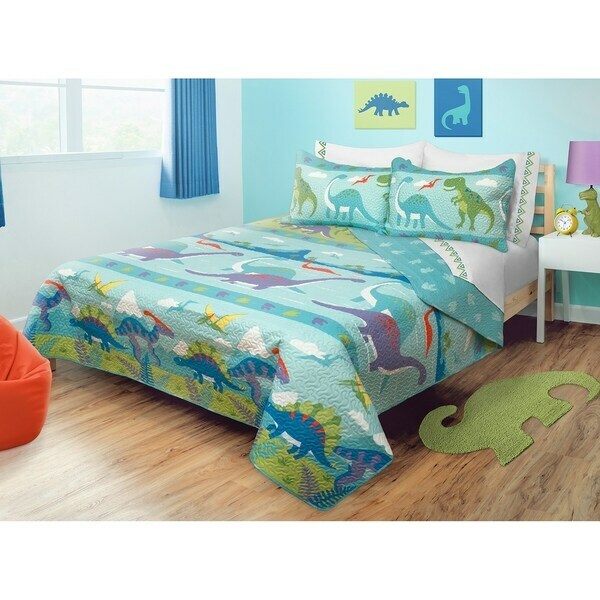 This bedding set will fit perfectly in any room. It is made of 100% premium polyester microfiber, which makes it soft and provides you with exceptional comfort while you rest. This superior quilt set will easily blend with most decor and set styles. Its unique details give you a subtle style and touch of elegance. This bedding set is made from premium quality fabric and has the remarkable style that adds exceptional value to each ensemble. Features: - 1 Quilt 64x86 - 1 Pillow sham 20x26 - Made with the highest quality microfiber yarns. - Wicking properties keep you relaxed. - Luxuriously brushed microfiber fabric is 100 percent polyester which provides an extremely soft and comfortable feel. - Fade, stain, shrink and wrinkle resistant. - Hypoallergenic, anti-bacterial, environmental friendly and resistant to dust mites. Microfiber material is cool and breathable and more durable than cotton. - Easy cleaning and storage; To clean, wash in cold water by hand or in your machine on the gentle cycle, air dry or tumble dry on low; Comes with protective plastic zippered case for easy storing and packing. Dimensions 86.0 In. X 66.0 In. X 3.0 In.